Ape Out lets you tear humans to pieces to the sound of percussive jazz, so why aren’t you downloading it right now? When you tell me your game is about an angry gorilla unleashing rampant destruction to the tune of percussive jazz, it’s safe to say you’ve secured my interest. You had me at “angry gorilla”, frankly. But then I learn that this angry gorilla game features ultra-stylised, Saul Bass-inspired visuals, a dynamic score set to procedurally generated levels, and Hotline Miami-style, hyper-violent gameplay? Now you have my undivided attention. Ape Out, which releases on Nintendo Switch and PC today, is exactly that, so successful in delivering a musical catharsis of simian simulation that its already become one of my favourite games of the year so far. Each of Ape Out’s four chapters (all separate stories in which the titular “Ape” gets “Out”) are depicted as vinyl albums with their own cover art, set list, and musical style, representing their simple narrative setup, level structure, and soundtracks respectively. The game will even pause midway through each “album” to turn over the hypothetical disc on the record player, and that comforting scratchy sound effect of the tonearm pressing against the vinyl briefly respites the action before you’re back to thumping humans into bloody pulps. Like Hotline Miami, Ape Out is also frantically difficult in parts, though its challenge isn’t quite as chewy as Dennaton Games’ psychedelic trendsetter, thanks in part to the simplicity of its gameplay rudiments. Your gorilla can punch, grab, or throw enemies afar, but you’ll need to seamlessly juggle between this core trifecta of actions to survive the hordes of armed guards that stand between you and freedom. Since our runaway primate can only take a couple of bullets before hitting the floor, and it takes mere seconds for an enemy to line up their shot, Ape Out’s levels turn into rhythmic gauntlets of spatial positioning and improvised gorilla warfare (sorry). Say you enter a room to find yourself facing the barrels of two armed guards, one explosives expert, and a beefy bruiser with a shotgun. One of many solutions might be to grab the bruiser and force his gun to fire at the two smaller enemies, before chucking him into the explosives expert to send them both into combustible oblivion. But wait, within those precious seconds, another soldier has suddenly entered the room. Not a problem for this monkey. Grab the severed arm from the remains of the exploded bruiser, lob it at the guard to daze him, and run in for the final blow. Ape Out is a constant barrage of these kind of quickfire puzzles and, just like playing jazz music, it works best when you improvise. 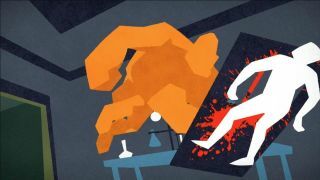 What’s more, each subsequent level in Ape Out introduces a fresh spin on the baseline foundation, which can come in the form of a new enemy type or an unexpected environmental twist. Thus, while the mission layout is randomly combobulated at the start of every new attempt, the levels all have their own thematic hallmarks that distinguish them from one another and contribute to Ape Out’s overall snappy pace. That procedural generation doesn’t always work to Ape Out’s benefit, however, as the algorithm’s inconsistent ability to disperse enemies evenly across the terrain means a level’s difficulty can vary wildly between nigh impossible and hopelessly easy. I spent a good 20 minutes trying to beat a particularly tough mission, for instance, before one randomised iteration of the map allowed me to effortlessly run along a straight corridor without encountering a single foe. This doesn’t happen all the time in Ape Out, but it occurs frequently enough to become its most noticeable point of contention. Of course, we can’t talk about Ape Out without mentioning that thumping, jazz-infused drum score. Composed specially for the game by Matt Boch, one member of Ape Out’s three man development team next to Gabe Cuzzillo and Bennett Foddy, the dynamic percussion ebbs and flows to the on-screen action in harmonious synchrony. Every single whack of the snare and beat of the tom-tom is used to punctuate the flow and rhythm of Ape Out’s gameplay in an inseparable partnership of sight and sound, underscoring your thumps, thwacks, and splats with audible impact. "Ape Out’s levels are rhythmic gauntlets of spatial positioning and improvised gorilla warfare"
Depending on how proficient you are at controlling a quadrupedal knuckle walker, Ape Out takes around around three to four hours to beat, but each album comes with a replayable Arcade mode, and the procedural nature of its design allows for repeat playthroughs to beat your previous high scores on any level of choice. Even if you only play through this mini masterpiece once, though, you can’t really go wrong. As an audio-visual circus that practically thrums with style and swagger, I can’t remember the last time a game was so consistently self-assured in the uniqueness of its own design. To bring this song of praise to its final coda, you should play Ape Out, and I’m not just saying that because of my aforementioned persuasion for angry gorillas. Stay tuned to GamesRadar+ for more coverage of the latest releases, including all the big new games of 2019 to watch out for.